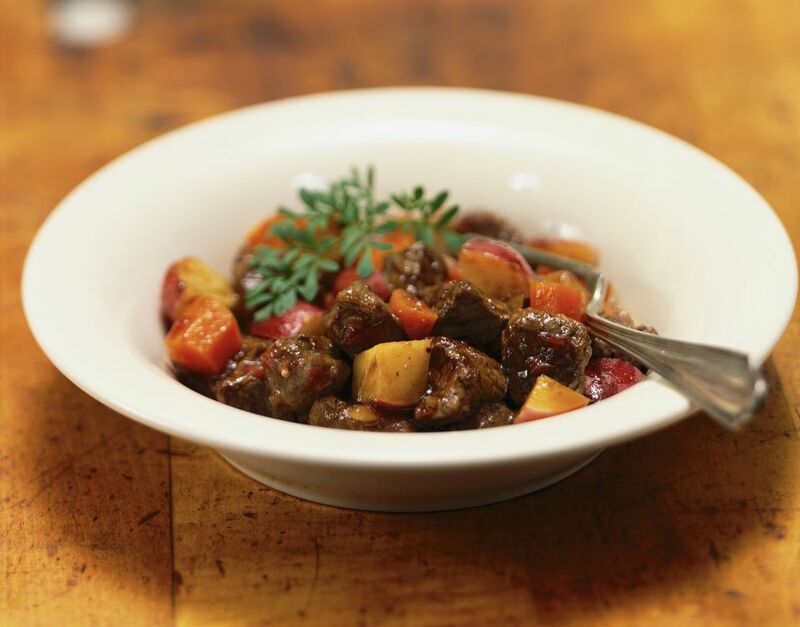 A twist on the classic French dish beef bourguignon, or beef burgundy, this recipe uses venison in place of beef—ideal when you have a freezer full after hunting season. It's named after the type of wine that's traditionally used—burgundy, that is—but you can use any type of bold, dry red wine that you have on hand. Admittedly, bourguignon has a significant ingredient list, but don't be afraid. It doesn't take much time for it to all come together, and then it's all hands-off as the venison cooks and become tender. In a large non-reactive container, combine the red wine, beef stock, Cognac, onion, carrots, garlic, parsley, thyme, rosemary, peppercorns, cloves, allspice, bay leaf, and venison pieces. Marinate the mixture for at least eight hours or overnight in the refrigerator. Preheat an oven to 300 degrees F Remove the venison from the marinade and drain it on a clean kitchen towel. Using a slotted spoon, transfer the vegetables to a bowl and reserve the marinade liquid. In a large Dutch oven set over medium-high heat, fry the bacon until it's crisp. Remove to a plate and let drain on a paper towel. Retain the grease in the pan. Add the drained venison to the bacon fat and cook over high heat, often turning, until the venison is browned. Transfer the venison to a paper towel-lined plate. Add the marinade vegetables to the fat and sauté them over medium-high heat, often stirring, for about 5 to 7 minutes. Drain any remaining fat. Stir in the tomato paste and allow it to cook for about 30 seconds. Gradually add the all of the reserved marinade liquid, continuously stirring to form a smooth sauce. Return the venison and bacon to the Dutch oven and stir to combine the ingredients. Cover with a lid and cook in the preheated oven for three hours, until the venison is tender. Using a slotted spoon, transfer the venison to a clean bowl. Strain and skim the fat from the sauce and pour it back into the Dutch oven, along with the venison. In a large skillet over medium-high heat, sauté the pearl onions for about 10 minutes until they turn tender. Continue cooking them until most of the cooking liquid evaporates. Add the mushrooms, salt, and pepper to the pan and sauté them, along with the onions for 5 minutes. Knead together the reserved tablespoon of softened butter and 1 tablespoon all-purpose flour to make a beurre manie, which is much like a roux. Stir the beurre manie into the simmering onion and mushroom mixture and cook it for 1 minute, until it thickens slightly. Add the thickened vegetable garnish to the Dutch oven and bring the stew to a simmer for 3 minutes.